At a very short distance from the Port of Oranjestad terminal, cruise passengers will have the unique opportunity to stroll unhurriedly through numerous fashionable stores that are stocked with imported merchandise and luxury items at excellent prices. Over the past 100 years Aruba has become a cultural mosaic, incorporating and embracing over 80 nationalities and cultures into its society. Visitors are welcome to experience this remarkable cultural attribute at the island’s galleries and museums where more insights into the unique Aruban identity are offered. Please visit the Cultural Information Booth inside the Cruise Terminal for additional information. 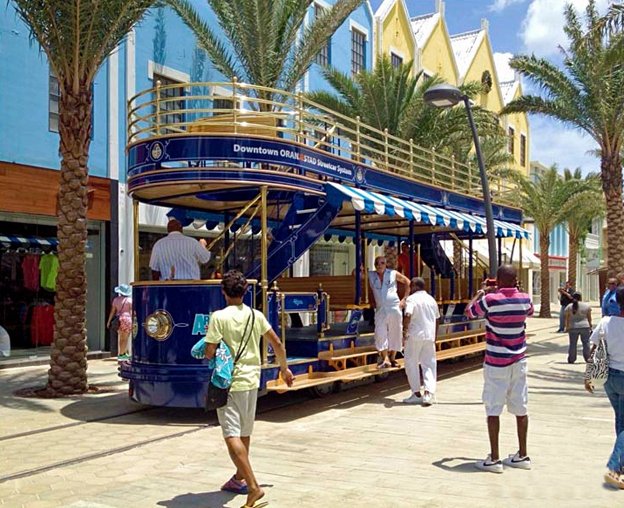 The Oranjestad trolley can be boarded right outside the port’s main gate. 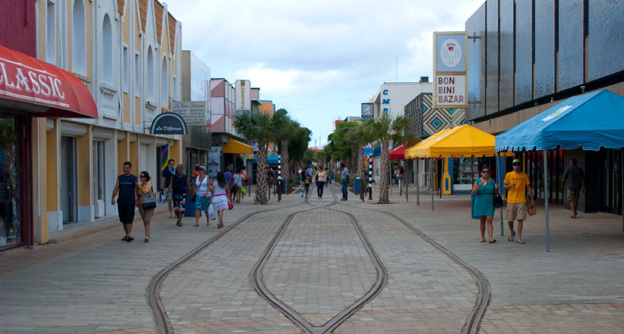 The streetcar is a replica of the Birney Trolley which will allow visitors to experience great shopping and dining in downtown but most importantly it will take guests through many significant eras in the history of the small island nation. 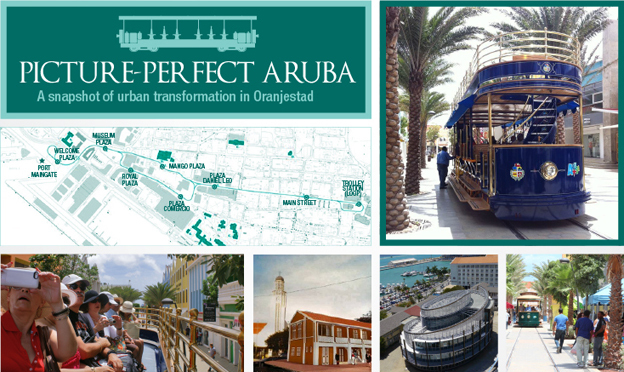 Port endorsed Aruba Tour Operators Association (ATOA) busses are located on port premises. Taxi’s offering private tours are also available outside of the terminal. *The Main Bus Terminal is located across the street from the Cruise terminal. *Car Rentals and independent Tour Operators are located outside the port. There are a total of eight stops where passengers will be able to go through our Pre-Ceramic, Ceramic and Historic Cultural Periods at the Archaeological Museum, past several historic 19th and 20th century buildings of Dutch Colonial Architecture, and past the executive and legislative branches of the Aruban government. Other points of interest directly accessible are: Aruba Bank House, Huisje Wild, Cas Henriquez and the Archaeological Museum, the Protesant Church, Zoutman Straat #1, Government offices, House of Parliament, Fort Zoutman (Historical Museum), Hotel Colombia, Wilhelmina Straat # 11, and the Cocolishi Building.